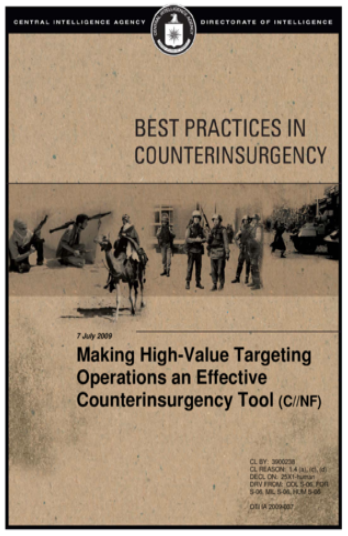 A release that the US Senate did not authorise is the CIA’s 2009 document Making High-Value Targeting Operations an Effective Counterinsurgency Tool. Its full text has just been released by WikiLeaks. As its name suggests, if you follow CIA-speak, it is a “dos and don’ts” manual on murdering influential foreigners. Julian Assange might have read it with some interest, as just such a influential foreigner, or “High-Value Target” as the Americans like to call such people. The scope of the publication makes it clear that its intended audience is not just CIA operatives, but “policymakers”. The politicians, in other words.